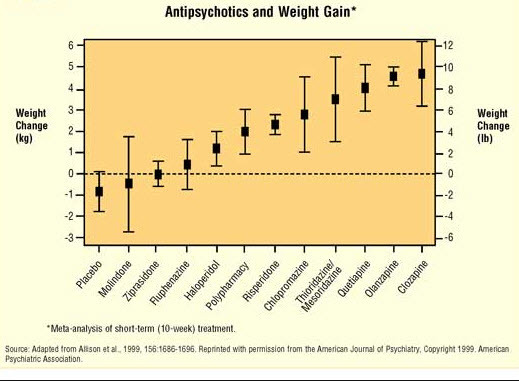 Many antipsychotics, especially some atypical or second generation antipsychotics, like olanzapine (Zyprexa) or quetiapine (Seroquel), cause significant weight gain, as well as insulin resistance (diabetes) and elevated lipids. What to do if the medication is helping (much more than alternatives) but the patient is developing these serious adverse effects? Two recent articles review the literature on strategies for managing these adverse effects. [See References]. Gierisch and collaborators analyzed 33 randomized controlled trials that lasted at least 2 months, enrolled adults with serious mental illness, and evaluated pharmacological and behavioral interventions targeting weight, glucose, or lipid control. The authors noted that there was a lot of data on behavioral interventions which was pretty consistent – these were associated with modest weight loss. Metformin had much better data, but the studies on its effects had pretty significant differences in terms of the amount of weight loss (although all showed that weight loss occurred). The anticonvulsants appeared very promising but there were few studies on their effectiveness. Mizuno also looked at overlapping data, but included a few studies that evaluated switching to a different atypical antipsychotic (ziprasidone or Geodon or aripiprazole or Abilify). In their evaluation of the studies that looked at switching atypicals they found relatively few studies with small samples and modest effect sizes. Metformin appears to be the intervention with the best support. Topirimate or zonisamide may be the most effective, but they have not been well studied. Behavioral interventions work, but their effects are modest and often not enough to allow a patient to continue to take an effective medication causing significant weight gain. Gierisch JM, Nieuwsma JA, Bradford DW, et al. Pharmacologic and behavioral interventions to improve cardiovascular risk factors in adults with serious mental illness: a systematic review and meta-analysis. J Clin Psychiatry 2014;75(5):e424-440. 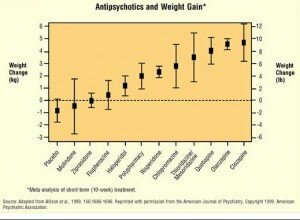 Mizuno Y, Suzuki T, Nakagawa A. Pharmacological strategies to counteract antipsychotic-induced weight gain and metabolic adverse effects in schizophrenia: a systematic review and meta-analysis. Schizophr Bull 2014 Mar 17. Epub ahead of print. doi:10.1093/schbul/sbu030.